I’m sure I’ve preached here in St Stephen’s at least once before today. But it was a very long time ago–perhaps thirty years!–and I confess I have absolutely no idea what the sermon was about. The only thing I do feel sure about is that I had a lot more hair then than I do now, and I dare say I was a lot thinner. Anyway, here I am again, and I’m very grateful to the Rector for inviting me to preach and for the chance to be in this beautiful place to worship with you all once more. I’d like to spend a few minutes reflecting with you on the story we just heard from St Luke’s gospel—the story of what we call “the Presentation of Christ in the Temple”. Luke begins with Mary and Joseph, pious servants of God who act in obedience to God’s law. The Evangelist is a little vague and even perhaps somewhat confused about the details, but the general implication of what he’s saying is clear enough. Mary and Joseph bring the child Jesus to Jerusalem to present him to God because they are faithful Jews. With that established, with the background sketched in, Luke then takes a fresh tack. Maybe that’s worth a pause. What is Luke saying? This is a moment, he’s saying, that’s filled with God’s Spirit. But what would we have actually seen if we’d been lookers-on that day? 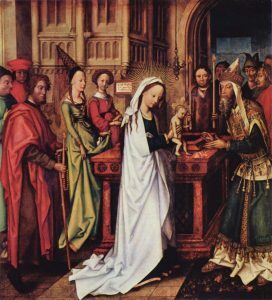 An old man meeting a man and a woman and a baby—indeed, a man and a girl and a baby, for given marriage customs at the time, Mary will have been fifteen at most. In other words, if we’d merely been lookers-on, we’d have seen nothing very remarkable. A perfectly ordinary scene! But if the gospel’s telling us the truth, that’s where God’s Spirit was at work, bringing about the salvation of the world. One of our problems, I suspect, is that we expect the Spirit always to work with pizzazz—something spectacular—tongues of fire, whatever. I dare say that happens occasionally. But if our faith is true we are surrounded by the work of God’s Spirit in ordinary things, for every breath we draw in our ordinary lives is a part of that work. An eight year old suddenly notices exquisite patterns in the snowflakes that are falling about her. We’re right—it is only snow. But it is none the less awe inspiring, if we allow ourselves to think about it, that there aren’t two snowflakes alike, and every single one of them is exquisite. Again–how silly, we say, that people so often get excited and go all gooey over things as ordinary as babies—or even kittens or puppies! On the contrary, says God’s Wisdom, perhaps it is foolish NOT to go all gooey when you are faced with the miracle and beauty of new birth, which according to Genesis is God’s promised sign of blessing from the very beginning (Gen. 1:28)! Just because God works the same miracle again and again, does that mean it’s not a miracle? Back to our story: an old man Simeon meets a couple with their baby, and the old man is indeed about to get very excited about a baby! It’s one of the most beautiful scenes in all Scripture, and it’s a pity that in rendering it our English versions somewhat let us down – and have done since Wycliffe. For Luke doesn’t say that Simeon “took” the child, as our translations have it, but that he “received” him – edexato – implying Mary and Joseph’s permission, and even perhaps (assuming that Mary is carrying the baby, as would be natural) her invitation. Quite often stained-glass windows and paintings will portray Mary handing the child into Simeon’s arms, and it’s an instance of artists perceiving something in the text that translators seem to have missed or at least ignored. What Luke implies is that Mary initiates the action, and Simeon responds. Sometimes we talk of Mary as if she was just passive, meek and mild in a weak sense, allowing things to happen to her. She isn’t—at least, not as Luke tells the story. She is strong. At the Annunciation she argues with the angel when it seems to her the angel is talking nonsense, and obliges Gabriel to explain himself. Pregnant herself, discovering that her cousin Elizabeth is pregnant, she sets off on a trip to the hill country to visit her. At the time of Our Lord’s birth, she says nothing, but, Luke tells us, she “treasures” all the words that are said and “ponders them in her heart”(2.19). And now it seems she perceives in the old man Simeon someone who matters and she hands the child to him. Simeon, then, receives the child “into his arms,” and so the Spirit’s promise to him that he should see the Lord’s Messiah is fulfilled – and more than fulfilled! For Simeon not only sees him, he touches him, holds him, embraces him; and given that Jesus comes to Simeon in the weakness of babyhood, for this moment Simeon actually carries him, as the stronger carries the weaker. Simeon has waited faithfully upon God, and the reward of his faithfulness is that for just a moment he becomes what Mary herself is, theotokos—God bearer! So it’s fitting that in that moment of joy Luke places on Simeon’s lips the third of the great prophetic hymns that mark the opening chapters of his gospel – the other two being, of course, Zechariah’s Benedictus and Our Lady’s Magnificat. All three hymns speak of the fulfillment of God’s promised salvation. Simeon’s hymn is briefer than either of the others. It’s an old man’s conversation with God. I dare say that’s why I particularly like it. It’s the word of one on the threshold of death. Yet like the others it is confident, joyful, and full of hope. So that means that from now on everything is going to be fine, does it? Simeon says that in Jesus he has seen God’s salvation. That, however, is not all that he has to say. Even as he blesses the little family, in that very moment, he also utters an aside that’s directed to Mary alone – Luke is very specific about that – and this aside is a much darker word that stands in tension with what has gone before. It’s a darker word, but it’s surely also a necessary word. In and through the light of God’s revelation in Jesus, Simeon and the holy family (and we too) may indeed see salvation. But that doesn’t mean that they or we are removed from the world’s sorrows. A life of love in a world that is often hostile to love will mean suffering for Jesus. And Mary his mother will share in his suffering. As we hear that, those of us soaked in Christian tradition naturally think of Mary standing weeping at the cross: stabat mater dolorosa, iuxta crucem lacrimosa. But of course it’s St John in his gospel who gives us our basis for that tradition, not Luke. The striking thing with Luke is that after his stories of Jesus’ birth and childhood, he will never actually mention Mary again until after the resurrection, when suddenly, in the Book of Acts, he will tell us that she is in the upper room, praying, in company with the eleven and the faithful women and the other disciples. Other people will have played active roles in Jesus’ story – people like Mary of Bethany, Mary of Magdala, Peter, and John – but of Mary we’ll have heard nothing. And yet at that point she’ll again be mentioned – mentioned, indeed, rather casually, in the middle of the list, as if her presence with the others was not something surprising, but rather something we ought to be taking for granted (Acts 1:14). The point, in a storyteller as accomplished as Luke, is surely clear enough. Mary, who manifested trust and obedience at the Annunciation, has continued to trust and obey, even though she was not centre-stage and therefore has been ignored. Quietly and without fuss she has endured the promised sword thrust into her soul. In her earlier trust and obedience she bore the Word of God in her own flesh. In that same trust and obedience she has endured seeing her son humiliated and executed as a blasphemer. So then she will be present and partake when the Spirit is given to the church and tongues of fire will come to rest on each (Acts 2.3, cf. 2.17). That is Mary’s story, as Luke tells it. Luke likes to pair men and women, and he does so in this morning’s gospel. Simeon doesn’t have the stage to himself. On comes Anna, an elderly woman who’s also a prophet and a worshiper of God. In some ways she balances Simeon, but Luke’s far too good a story-teller to have her merely repeat or reinforce what Simeon has done: so although he presents the two figures in a way that’s somewhat symmetrical, he also gives them different functions. So, whereas Simeon’s words were quiet, addressed almost in confidence to the holy family, Anna’s are public, broadcast to everyone and at large. And whereas Simeon’s word touched on the whole story, Anna’s word redirects us the central point. It’s not that nothing else matters. There’s a great deal that matters, and some of it matters very much, especially in our dealing with each other. But when it comes to the bottom line, when it comes to our hope for true and lasting deliverance, for “redemption,” then there’s only one place to go and only One who can do it, as the Psalmist knew, for “the earth is the Lord’s” (Ps. 24.1). Well, says Anna, here He is! A late seventeenth/ eighteenth century Painter’s Manual speaks of Anna standing next to Joseph, and in her hand a tablet with the inscription, “This child has created heaven and earth.” I dare say Luke himself was hardly quite there, but his narrative was certainly moving in that direction. Mary and Joseph brought Jesus to Jerusalem to present him to God. I don’t doubt the Evangelist wants us to understand that that’s what they truly thought they were doing, and in some sense what they were doing. Yet Simeon and Anna’s words make clear that in a deeper sense they weren’t presenting Jesus to God at all: it was Jesus who was presenting them. And so it will always be. From The Kingdom of God, Francis Thompson (1859-1907). The image of falling and rising reminds us – and Luke surely intends it to remind us – of Isaiah 8, where the prophet and his children are set for “signs and portents” in Israel, at which some will stumble and others gain new strength. In addition to the present instance, see, e.g., Mary and Zechariah in the birth narratives; the widow of Zarephath and Naaman the Syrian (4:26-27); the “woman who was a sinner” and Simon the Pharisee (7:36-50); the disciples and the women who “minister” to Jesus and them “out of their substance” (8.1-3); and the parables of the lost sheep and the ten coins (15:4-10). Bovon, Luke 1: A Commentary 1.106. Some versions, notably some readings of the Vulgate, read “Israel” here. At the time of the disastrous second revolt against Rome (A.D. 132-35), documents were actually dated to years from “the redemption of Israel” and “the redemption of Jerusalem” – in other words, Luke’s expression clearly reflects real Jewish aspirations of the period (see Fitzmyer, Luke 1.432). “Saint Simeon the receiver of God holds the infant Christ in his arms, who gives him his blessing. The Virgin on the other side of the altar stretches out her arms to the child, and behind her Joseph carries two doves in his robe; near him the prophetess Anna points out Christ and holds a scroll with these words: ‘This child has created heaven and earth’” (Dionysius of Fourna, Painter’s Manual, trans. Paul Hetherington [Torrance, California: Oakwood, 1996 [London: Sagittarius, 1974] 32). Dionysius lived from c1670 to sometime after 1744. Despite Raymond Brown, The Birth of the Messiah 445, I am not entirely convinced that Mal. 3.1 was actually in Luke’s mind as he composed his version of what he probably received as a Jewish-Christian oral tradition (cf. Bovon, Luke 98). But that the church has made and continues to make such a connection can hardly be denied, as paintings such as Ambrosio Lorenzetti’s Presentation in the Temple (1342: now in the Uffizi), not to mention our own lectionaries, make clear (see Common Worship, readings for The Presentation of Christ in the Temple). The church did not make this connection without reason. Copyright © 2016 Christopher Bryan. All Rights Reserved.